← …and on my first day in China, I broke my tooth. Just to put a neat little bow on Kyrgyzstan, which I miss: I took a marshrutka to the edge of Osh and hitchhiked southeast to Sary Tash, paying a total of 250 som ($5) for the three or four hour trip up, and then I was confronted with this amazing sight below: a Mongol Rally car with three Australians, stuck. 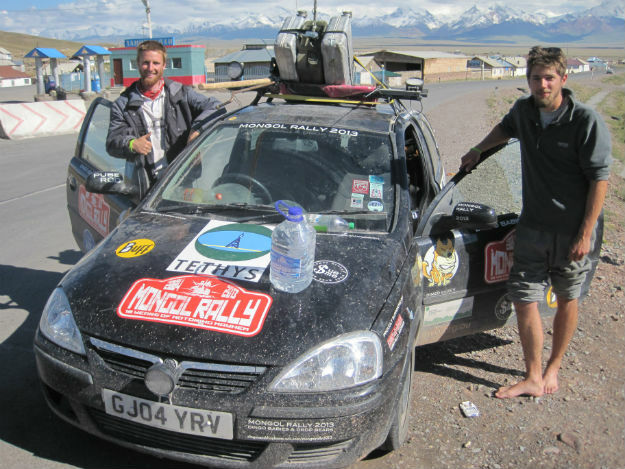 Do you know about the Mongol Rally? It’s a drive from London to Mongolia (on any route you wish) as an excuse to party afterward. The main rule is that your car’s engine must be 1.2cc or smaller and then you donate it at the end. This car was with a convoy but somehow one of the cars took off with their keys—and they only had one set of keys. They thought that someone would notice their absence and come back at any moment, but they waited seven hours, all the while incredibly good-humored about their predicament. When other Aussies finally arrived to save the day, they were still all smiles and laughs. The journey is more important than the destination in the Mongol Rally. Let’s put it this way: the bathtub that had been attached to the top of the car had broken off just days before. 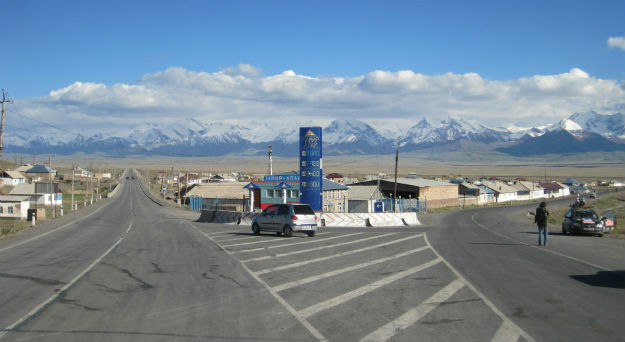 The road is nice and paved all the way to the Kyrgyz border with only one checkpoint. The Kyrgyz stamp you out, then you stand and flag down one of the passing trucks to two more checkpoints over the next few kilometers, then you come to the Chinese post where dusty Chinese and Soviet flags in the office say it all: there will be nonsensical delays and bureaucracy. They make you read a government proclamation in unintelligible English but the point is for tourist’s “safety” travelers aren’t allowed to hitchhike with one of the many trucks or cycle on your own to the border post where they actually stamp your passport, 142km away. I aligned myself with an Uzbek and two Tajiks who had been through the border before and we waited for transport to materialize. A guard went through my bag, but asked only one question: “Do you have any books?” I didn’t. I asked if there was a toilet. The guard, already angry at a French cyclist who challenged his authority, snorted, “No! There’s no water!” There was neither water nor food nor toilets for nearly the entire stretch from Sary Tash to where the Chinese stamp your passport which is hundreds of kilometers. At one of the Chinese checkpoints there was a small store, but that was it. Isn’t this pretty? The Pamir mountain range goes in a straight line for as far as I could see, an incredible sight on this clear day. 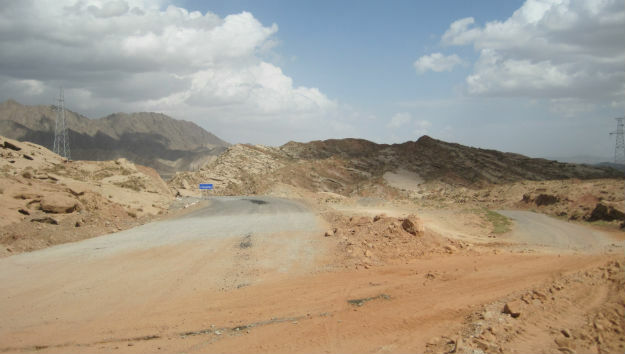 The killer road to Kashgar, still under construction. This shortened my life span. Our minibus cost 100 yuan ($16.50) each for the ride that took about five hours in total. Then it’s another two hours to get to Kashgar, 30 yuan ($5) in a shared taxi. 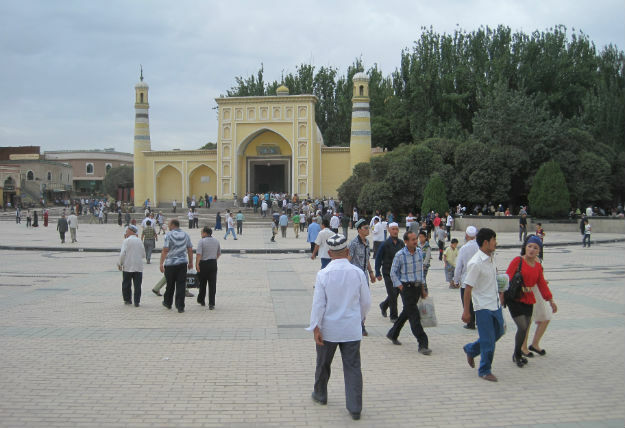 Id Kah Mosque in Kashgar. I arrived horrendously tired and filthy, but buzzed to be in such a dynamic place, which this photo fails to show. As luck would have it, a retired American dentist was staying at my hostel here and he agreed to have a look at my tooth if I could find a magnifying glass because he lost his reading glasses. I wish one of his kids would have taken a photo of me laying down on the low table where they were playing cards, the good doctor with a magnifying glass and a flashlight poised above me with ragged, bemused travelers in the background. He said it was a very clean break and I can let it go for now, but that if I didn’t do something eventually, all that chewing on the other side of my mouth isn’t good in the long run. Soft or medium bristle toothbrush? Soft. Dental floss or dental tape? Tape. Does fluoride make you dumb? Yes, he said he never uses toothpaste, just water and an antibacterial rinse like Listerine. In Kashgar Old City Hostel is better than Pamir Hostel because Pamir has street noise and rock-hard beds. Both have dorm beds for 40 yuan ($6.65). Both have English-speaking Chinese staff and lots of Chinese travelers as it is school holidays now. And Old Town has the coolest courtyard in all of Kasghar! Glad to hear the tooth isn’t so bad, bummer that neither of us are in India to take advantage of that exchange rate! There are two courtyards here, in fact. I am, I am. I am even thinking of making my China trip much shorter. 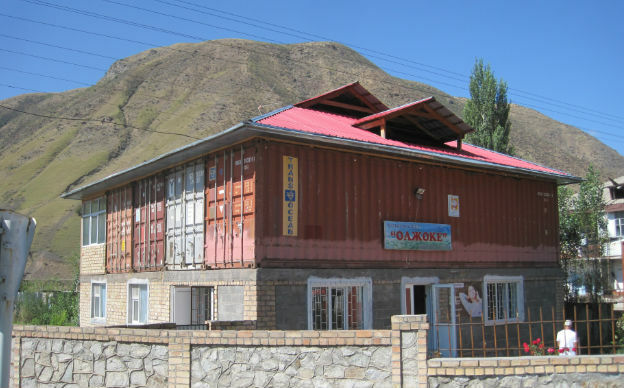 Sary Tash was the saddest place I went in Kyrgyzstan in 2004. All my friend Antoine and I wanted was to change money, have a great lunch and then cycle off towards the border. Instead somebody stole my wallet (luckily it only had a couple of hundred som and nothing else in it), everybody was drunk (it was market day), a man tried really hard to pick a fistfight with me, we couldn’t find a decent open restaurant, and nobody wanted to change money. Then the Kyrgyz border guys on the way to Tajikistan tried to work us over for a bribe. It was a downer of a way to leave a great country. My ride over the other border crossing (the Torugart) last summer was dismal on the Chinese side both times; massive flooding on the way into China, and a closed border on the way back. Great scenery, but what a pain in the backside that border was. I must admit: they did a pretty good job blending them into the building. Thanks for this! 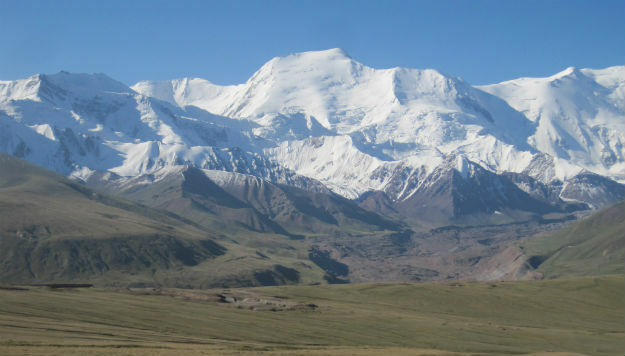 starting from Kashgar to Bishkek tomorrow. Really? Let me know how it goes on that new road–if it is really all new.